"Here are samples ofthe custom sea glass commission jewelry I've made for different folks..."
linje designs sea glass commission jewelry is her own creations using sterling silver, gold-filled, copper, or brass wire and your special treasures to create one-of-a-kind unique jewelry for you. Lin says: "I make each piece like it would be one of my own. 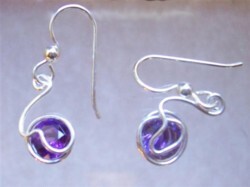 Each piece is wire wrapped without glue, without soldering." 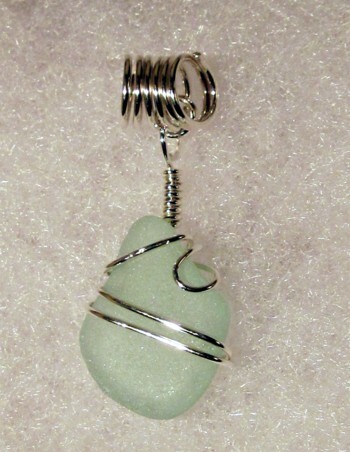 Deep Ocean Green beach glass pendant wrapped in sterling silver with rabbit ear bail. Handcrafted to order. Light Sky Blue pendant wrapped in sterling silver. Handcrafted on commission. 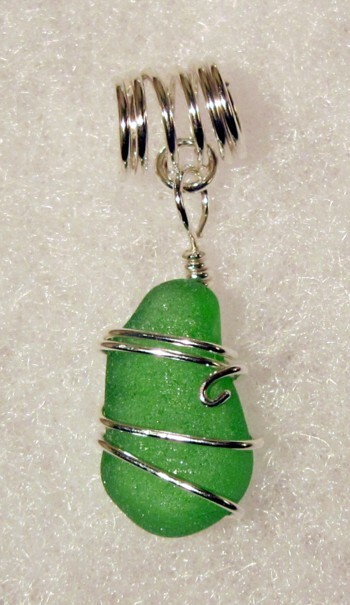 Brilliant Green beach glass pendant - a great gift choice, Stu! 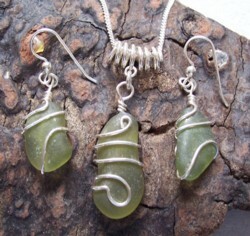 This dark olive sea glass set is a commission made with sea glass from Italy. This green sea glass pendant is wrapped with copper. My mom asked me to do this for one of her friends. 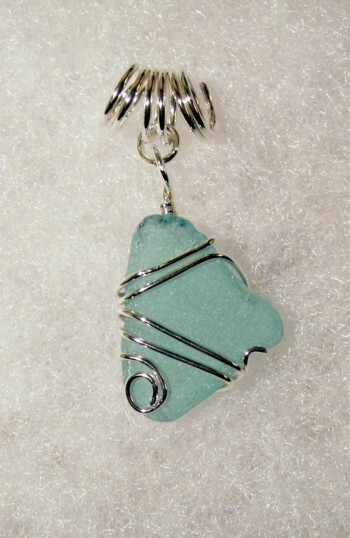 This light blue sea glass wrapped in sterling silver was ordered by a customer for a friend as a surprise. Her friend had told her she really liked this piece she had found and the customer secretly had it made up. When it was presented to her friend, her friend had tears in her eyes because it was "her sea glass." 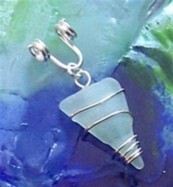 Sea Glass Commission Jewelry: This lavender sea glass was wrapped with sterling silver for a customer in Maryland. 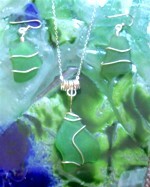 These pieces of green sea glass were found in Antigua by a couple vacationing there. The husband had this pendant and earring set made as a surprise for her. She had tears in her eyes when she opened it up. So nice. I'm sorry for the photo, it's the only one I had! I've done commissions using beach finds other than sea glass and semi-precious stones. Here are some pics of different commissions. This fossil as well as the two farther down the page are from Flag Pond in Maryland. They are very unique. I wrapped this one with sterling silver as a pendant. The lighter-colored fossils are not commonly found, as most of the fossils are various shades of gray or black. This was another shell fossil collected at Flag Pond in Maryland and wrapped in copper. 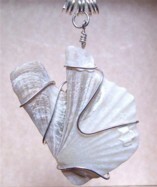 This seashell was very delicate and the owner wanted me to do a very simple wrap with it. The seashell held a lot of meaning in her family.They frequent Sanibel Island and have done so for a very long time. She was having it made for her sister as a surprise. These were cone-shaped stones with a round face. Although somewhat difficult to wrap, they did turn out quite nicely, as you can see here. You've heard the saying that "Diamonds are a girl's best friend?" Well, they didn't know about sea glass enthusiasts did they? Most of us have very special memories attached to our sea glass and what better gift than to share those memories with a loved one or for oneself if a person doesn't have the time or the know-how to make their sea glass into a quality piece of jewelry. It's a thrill and a I get a terrific sense of satisfaction every time I hear my customers say, "I love it," or when they tell me what happened when they gave the gift.